Everyone knows that Katrina Kaif is quite excited about her upcoming movies. The actress is currently shooting with Ali Abbas for 'Tiger Zinda Hai' and she will be sharing screen space with Aamir Khan and Amitabh Bachchan in Vijay Krishna Acharya's ' Thugs of Hindostan'. 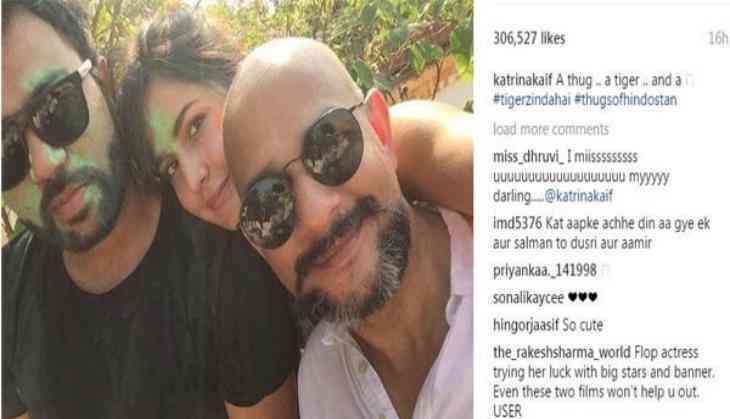 The 33-year-old today took to Twitter and shared a picture of herself with both the directors and captioned the picture as, "A thug .. a tiger .. and a #tigerzindahai #thugsofhindostan." On a related note, Katrina Kaif will next be seen in Anurag Basu's ' Jagga Jasoos,' alongside Ranbir Kapoor. After much delay, the flick is scheduled to release on July 14th.